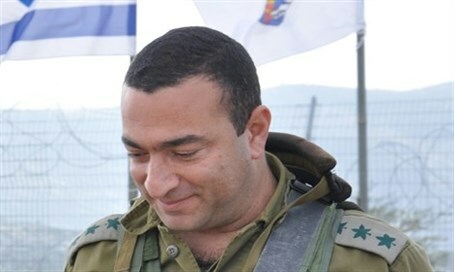 Deputy Defense Minister welcomes decision to close the investigation against a commander who shot dead an Arab rock thrower. The IDF, along with other Israeli officials, had initially backed Shomer over his actions, noting the danger to his life in the attack as the rock smashed the windshield and penetrated into the car. Similar rock attacks have caused death in numerous cases, such as in the murder of Alexander Levlovitz last September. But after the radical leftist NGO B'Tselem released video of the incident it pressured the IDF to launch an investigation into the shooting of the terrorist Mohammed al-Kasbeh. Coincidentally video filmed by B'Tselem activists also spurred the investigation of another soldier who is currently charged with manslaughter, after he shot a wounded terrorist in Hevron three weeks ago over concerns he was going to detonate an explosive belt. In response to the rock attack, Shomer exited the vehicle and followed IDF procedure to apprehend a terrorist, calling out a warning and shooting in the air before firing twice while aiming for the terrorist's legs. In the investigation, it was found that Shomer shot at the terrorist's legs while he was in motion and not while standing still, and therefore his shots were not precise and killed the terrorist.